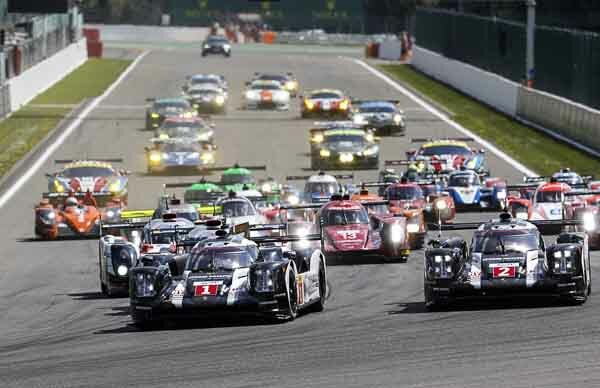 – The WEC efficiency regulations limit the amount of energy that can be used per lap. On the 7.004 kilometres long lap of Spa-Francorchamps, the Porsche 919 Hybrid can use 6.37 megajoule of electrical power from energy recovery systems and 1.784 kg/2.464 litres of petrol. – At normal race speed, the Porsche 919 Hybrid is due for refuelling after a maximum of 24 laps. – For a permanent race track, a lap on the Circuit de Spa-Francorchamps is remarkably long and peppered with 19 corners, many of them being spectacular ones. After the start, the field has to go through the right-hand hairpin of “La Source” before racing downhill to “Eau Rouge” to be compressed through its left-right combination. The uphill “Kemmel” straight leads to the winding back section of the circuit. After snaking through “Malmedy”, “Rivage”, “Pouhon” and “Fagnes”, at the exit of the right-hander “Stavelot” it’s full throttle again until the very tight “Bus Stop” chicane before the start-finish line. – The circuit is situated in the triangle of the towns Stavelot, Spa and Malmedy. Because the German border is only 20 kilometres away, many race fans from this neighbouring country tend to attend. – In 2016, the two 919 Hybrids locked out the front row of the grid. Bernhard and Hartley, who back then shared the car with Mark Webber (AU), took pole position with an average lap time of 1:55.739 minutes. The sister Porsche of Jani, Romain Dumas (FR) and Marc Lieb (DE) started second. – In the race, Jani/Dumas/Lieb finished second, despite difficulties with the hybrid system. The 919 of Bernhard/Hartley/Webber suffered two punctures and was pitted for more than one-and-a-half hours for repairs of consequential damage (body work and front gearbox). It was finally classified 5th in class. – Earlier in the race, Hartley set the fastest lap of 1:58.431 minutes. Complete report of the 2016 FIA WEC 6H in Spa Francorchamps.